Hello, Good day. 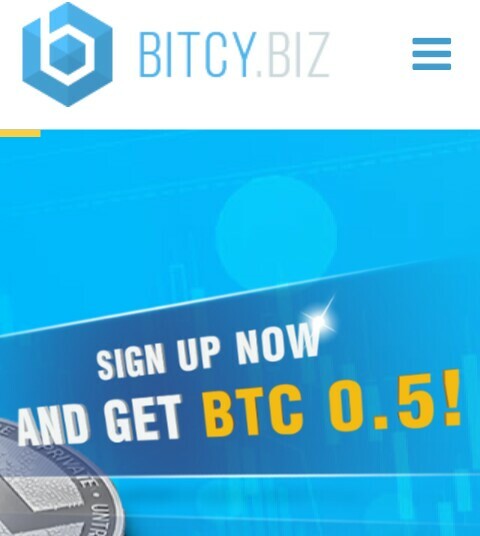 Today we'll love to review yet another BITCOIN HYIP Investment Opportunity known popularly as BITCY. BITCY has been around for some time now, with a team of experienced traders, they seem to be making money for their Investors. Well I'm not endorsing BITCY neither am I making any recommendations. WARNING: BITCY IS NOW A SCAM, DO NOT INVEST. This review is based on statistics and personal experiences and not based on any affiliation with the company so we'll be very honest and straight forward. It'll Also reveal is BITCY is paying or not paying, scam or LEGIT, risky or Safe e.t.c. This review of BITCY.Biz will help you, the Investor, to choose rightly whether to invest or not and also we'll look at their compensation plans and give our professional advice on which you should invest on and why?. So sit tight, grab a cup of coffee let's hit the road. BITCY is currently offering deposit bonuses of upto 0.5BTC according to information on their site! BITCY Also claims that “Bitcy Limited was founded 7 years ago by a community of stock market traders with our irreplaceable CEO Richard Lester at the helm. Our main priorities are research and integration of effective trading patterns. Our innovative approaches and flawless reputation has attracted to our ranks a number of top traders who demonstrate excellent long term performance. Invest your money with professionals and join the successful investor community at Bitcy!”. Well lemme outline clearly that BITCY is an HYIP Investment i.e high yield Investment program and should be regarded as involving a high level of risk. But you're pretty lucky to be in BitInvestors Club because we'll try our best to make sure your exposure to risk is greatly reduced. So let's look at some specific features of BITCY Investment. WHEN SHOULD I QUIT PROGRAM TO AVOID LOSS: SORRY THIS OPTION IS ONLY AVAILABLE TO PAID CLUB MEMBERS.